Shell: Breathe weave stretch woven fabric with neoprene trim and synthetic leather palm, fingers, thumb, _ wrap caps, and index finger and thumb reinforcement. Insulation: Primaloft insulation, Hydrowick microdenier lining and Gore-Tex insert. Waterproof, Windproof, and Breathable. Guaranteed. 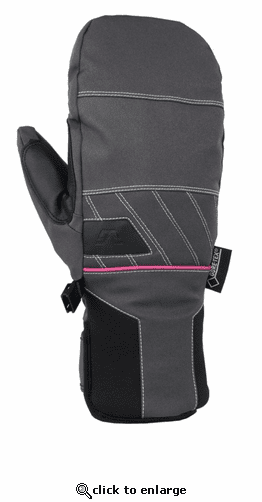 Features: Gore-Tex , Primaloft, neoprene cuff with hook and loop closure, _ wrap caps, index finger and thumb reinforcement, palm and thumb reinforcement. GORE-TEX technology keeps water out of our gloves, while allowing moisture from the inside (perspiration) to easily escape. The result is a glove that\xCDs highly breathable and totally waterproof. The microporous structure of the GORE-TEX membrane is what makes GORE-TEX products completely waterproof. Each microscopic pore is about 20,000 times smaller than a drop of water, which means no external moisture \x84 from rain to snow \x84 can penetrate the membrane. The pores in the GORE-TEX membrane are 700 times bigger than a water vapor molecule, so perspiration can easily evaporate through and you can stay dry from the inside out. GORE-TEX Guaranteed to Keep You Dry. Engineered by Gordini to combine the warmth of wool with the comfort and wicking superiority of fleece, Lavawool in independent tests outperforms 100% wool and leading synthetic fabrics. How? Lavawool utilizes the inherent insulating properties of wool to keep you warm; but, unlike pure wool, which absorbs and retains moisture, Lavawool wicks moisture quickly from your skin and garment with its patented weave of synthetic fibers and wool. This marriage of fibers is the Lavawool advantage \x84 keeping you drier and warmer wherever your cold weather adventures take you. InSilk is Gordini\xCDs exclusive silk insulation. As nature\xCDs premium insulation, it is a hypoallergenic, all natural, renewable resource that is highly breathable, will not compress or get wet and features climate controlled properties; keeps you warm when the mercury drops and cool when temps rise.